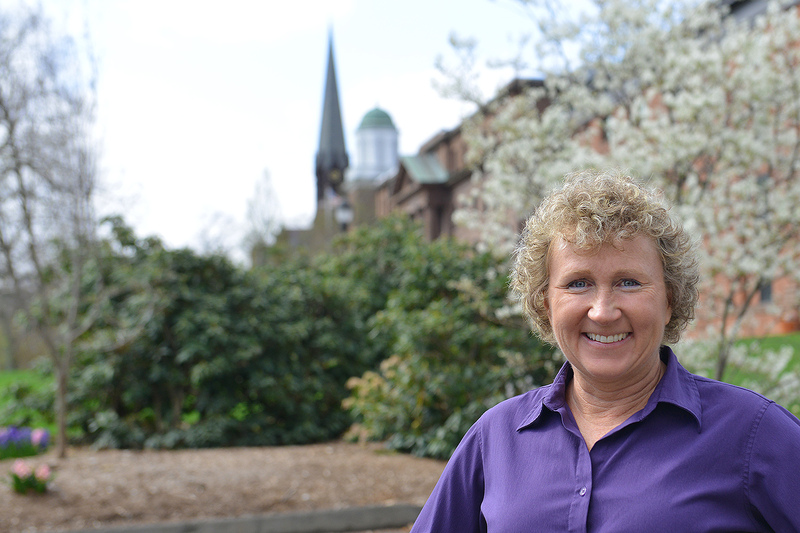 In this Q&A, we speak with Sherri Condon, accounting specialist for Auxiliary Operations and Campus Services. Q: Sherri, when were you hired at Wesleyan, and what were you hired as? A: I was hired Sept. 24, 2001 as an admin assistant III for Rental Properties. Q: What accounts do you oversee in Auxiliary Operations and Campus Services? A: I oversee the non-academic departments: housing, transportation, dining, vending, laundry and Wes Card; I am a first contact for risk, for auto accidents. I also collect and reconcile the faculty, staff and graduate rents for on-campus housing. Q: I understand you’re involved with the United Way Women’s Initiative. A: I am a volunteer and I am also on the committee for grants; I enjoy giving money away to organizations. I will also volunteer helping out with United Way’s annual fundraiser Power of the Purse. Q: Are you involved in any other type of community service? A: I am a volunteer for Middlesex Hospital for their GoPink and Appetite for Life events that help fund projects at Middlesex Hospital’s Cancer Center. These two are very near and dear to me. Appetite for Life is a fun event in June; you just have to go out to eat, simple! I will always GoPink; I am a volunteer this year for the Fun Run at Middletown High School on Sept 17th. I’m also a group leader for Wesleyan’s CERT team on campus. We are Team Sherri! I have a great team and we work with the university and the City of Middletown on different projects throughout the year. Q: What is your town of residence and what are your hobbies outside of work? A: I live in Middletown, a little over a mile away. My hobbies are running and fitness. I also enjoy spending time with my husband and daughter. Q: What is your personal interest in fitness? A: I love to run; I would run 24/7 if my body would allow it, but it doesn’t. Running provides me a social outlet, I usually run with two or three friends. I generally run 25-30 miles a week, depending on other commitments and/or if I have a big race coming up. I am part of a society called RUN 169 – it’s a commitment to run every city/town in Connecticut. There are 169 towns, and I have 72 or 73 today. I’ll get a new town this weekend. I also love to teach group fitness. I have been teaching fitness since 1983. My first certification was in 1984 and I’ve maintained it throughout. I love teaching new classes and also teaching old-school classes, but my favorite class to teach is Step – I love it and will continue until my body says no more! I currently teach classes at It Burns Fitness; I teach Body Burn, which is a weighted body sculpt class. I also teach at YMCA downtown on a substitute basis, and I have been averaging three to four times a month. I generally sub Step and Cycle classes. Q: What is a typical work day like for you at Wesleyan? A: Somewhat typical, depending on the time of month. The beginning of the month brings several invoices to my desk, I process all of the utilities on campus, so I get all of the Eversource Energy invoices to pay. Other times I am processing the dining journals for the events the departments have on campus. I also process the chargebacks for the copiers on campus, including the per copy charge backs for departments with color machines. A: I really enjoy my department and the people I work for. I also enjoy that I am right here in Middletown. I love being on and part of this campus. I feel it is a great part of me and I enjoy being part of this community.